Eliminate the rattling and looseness of the glove box door by simply replacing worn out or missing rubber stoppers with these high quality reproductions. Includes 2 bumpers. Side seat hinge bracket cover clips. Does one seat. Replacement console box lid latch button spring. Kit includes approximately 100 hog rings. 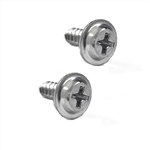 Replace worn out or missing seat stoppers with these quality reproductions. Includes 2 stoppers and 2 mounting screws. Note: One pair required per car. Reproduction of the glove box door arm rubber stopper.